Such a beautiful look! I love the white distressed denim! 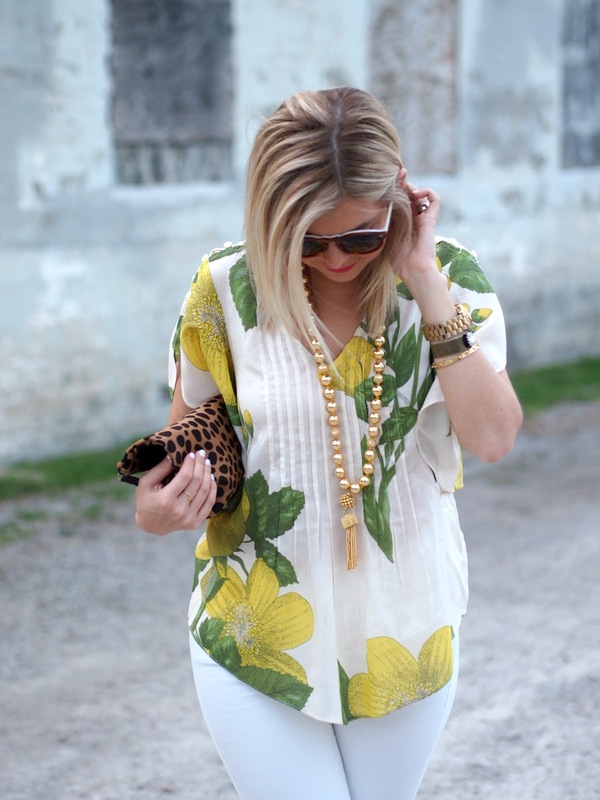 I love all the tropical, fruit, and citrus prints I have been seeing! The pops of yellow and green are awesome! Love this print! And I love the yellow and green combination. Such a fun look! I love flowy tops in the warmer months! I love this almost all white look with the pops of yellow! Beautiful outfit, love your top. You look so chic! Cutest top!! I love the print! :) gorgeous as always! Such a unique print. I love it! In love with this blouse!! So cute. You look gorgeous. Looking very pretty in this stylish, perfect for Spring outfit! I like your top and necklace very much. I definitely need a tassel necklace!